Our unique media training ranges from Media Training 101 to Crisis Media Training and Strategies and is based on actual experience (not just theory) working behind the microphone as a reporter asking the tough questions, and as the media spokesperson in front of the cameras responding to reporters’ questions. Michael has appeared in media markets throughout the U.S. and around the world. He has made numerous appearances on the major broadcast and cable networks such as CNN™, Fox News™, NBC™, ABC™, PBS™, and more. As the media spokesperson in crisis situations he has planned and conducted news conferences, designed the primary message agenda, and trained other organizational personnel to handle the tough media crowd as well. 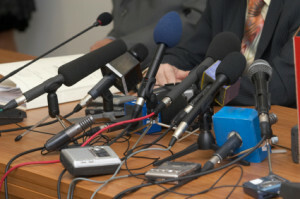 Media Training 101 is offered for those who have minimal experience in dealing with the media. We show you how to think like a reporter and develop your communications agenda – responses to the questions the reporter will ask. In our recorded mock interviews, we help you to deliver your message with clarity, credibility and confidence. Our Advanced Media Training includes handling the hostile media, how to survive the ambush interview and how to remain cool under fire. We also teach you the techniques for conducting a remote interview, where the interviewer is in one location and you are in another and must talk to the lens (the camera) without personal interaction. In Crisis Communications workshops we teach you how to develop the crisis management plan and then successfully handle the crisis in the media. You will learn how to respond in the first minutes, how to deliver an effective media message with authority and credibility. You will learn who says what and when, what NOT to say, and how to control the media and the message rather than the media controlling you and your message. You’ll learn how to monitor the media message for accuracy and how to correct misinformation than can run rampant in a crisis situation. This advanced media training is also based on actual experience handling crisis events as the media spokesperson. All media workshops include coaching, not lecture, with numerous on-camera interviews and presentations that are critiqued with positive reinforcement where you will see definitive improvement from one to the next.